How Much Am I Owed for Property Damage After a South Carolina Car Accident? In South Carolina, the at-fault driver’s insurance company should compensate you for property damage to your vehicle as well as any injury you have sustained. If the driver who hit you was uninsured, your own insurance company should cover the property damage. Under no circumstance should you be responsible for covering the repairs when the wreck was another driver’s fault. No matter the terminology, the point is to put you back in the same position you enjoyed prior to the crash. That means if you had a $15,000 car before and only a $10,000 car now, you should be allowed $5,000 in compensation to make you “whole.” If your car was totaled, the insurance company should write you a check for the fair market value for your car at the time of the wreck. Fair market value is not determined by how much you paid for the car or your emotional attachment to it. Fair market value is simply the amount of money a reasonable person would pay you to take ownership of the car. In addition, punitive damages may be recovered if the at-fault driver was intoxicated or reckless in some other way. If the insurance company, be it the at fault driver’s or your own insurance company, is unwilling to fairly compensate you for the property damage, you should notify the civil division of your County Court. In South Carolina, the civil division is known as the Court of Common Pleas. If you call or visit the Clerk’s office and tell them you are in a dispute with the insurance company over the property damage to your vehicle, the Clerk’s office should help you fill out the necessary paperwork to arbitrate the case. In South Carolina, judges and juries do not decide how much money you should be allowed for property damage. Rather, it is a three-person panel – comprised of attorneys – that will listen to your arguments, as well as the insurance company’s, then review the documents and make a decision as to the proper amount of compensation you should receive. Unlike a personal injury claim, you probably do not need a car accident attorney to represent you in the property damage arbitration. Most property damage arbitration in SC is handled directly by the client. The arbitration panels are familiar with SC law and also recognize that insurance companies do not get rich by compensating you fairly. The panel members that I know are generally sympathetic to the hardships caused by being without a vehicle or having to drive a car that is now of lesser value. To summarize: the first thing you need to do after a SC car accident is contact your insurance company and set up a claim. 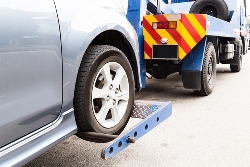 That way, if the at fault driver is uninsured, your own insurer will know the facts of the case, where your wrecked car has been taken, and what needs to be done to make you whole. After appraisals are completed, an offer should be made as to your property damage. If you believe the offer is fair, you can accept it and have your car repaired or totaled and move forward with your life. If the offer is unfair, you can negotiate with the insurance company, request a second appraisal, have the car independently appraised, or jump ahead to filing for arbitration. No matter which option you choose, remember that the purpose of SC’s car accident laws is to compensate you for every harm and loss. Nonetheless, if you seek arbitration, be prepared to present evidence of why the insurance company’s offer is too low. Once more, that may include an independent appraisal, copies of the Kelly Blue Book value, receipts relating to any improvements or additions you made to the car, and all other evidence that you think demonstrates your car was of greater value than what the insurance company claims. Though I rarely handle the property damage aspect of my injured clients’ case, my team will gladly answer questions you have, as we do not want to see anyone exploited simply because they have not hired an attorney. If you have questions, call my office for a free phone consultation at 803-790-2800. You can also receive free copies of my books by clicking here. It is very clear that Kenny chooses his staff with great care and only hires those who reflect his values and ethics. I have nothing but great things to say about Kenny and his team. I will recommend every chance I get.